Jessie and I finally got our hands on the large Rhino Wobbles toy from Tuff Enuff, and we love to put any toy claiming to be tough through its paces! The Wobbles are a series of tall safari-themed dog toys that have been reinforced with several layers of durable material. (Click here to learn more about Tuff Enuff’s Wobbles!) 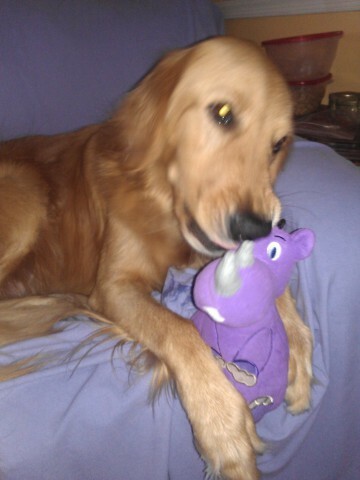 The Tuff Enuff crew graciously sent Jessie the purple Rhino design in the more suitable large size. The 8in. tall Rhino was an excellent challenge for my golden pal! 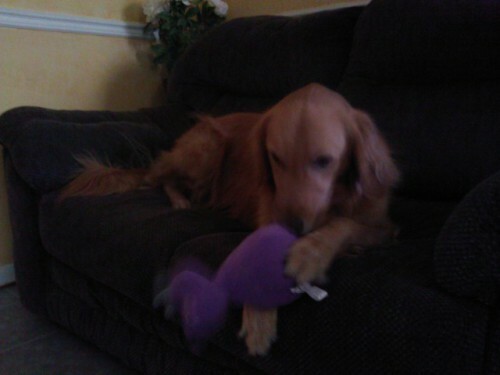 I'm sitting pretty, can I have my toy now? 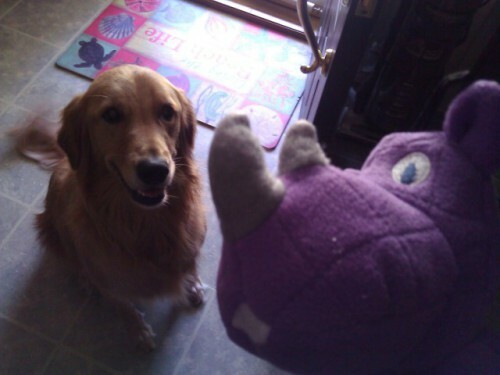 I felt that the Rhino was lighter than I had expected it to be, but it was apparent that the toy was designed to last plenty of rounds of fetch or catch. 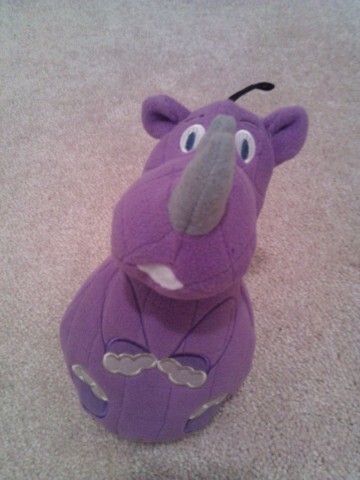 Initially I had a tough time finding out exactly where the squeaker was on the Rhino, and I was just about to give up until I pinched the toy of its head- It certainly squeaks, and its “hidden squeaker” presented a fun challenge for Jessie to recreate the squeak sound when I gave the Wobble to her. 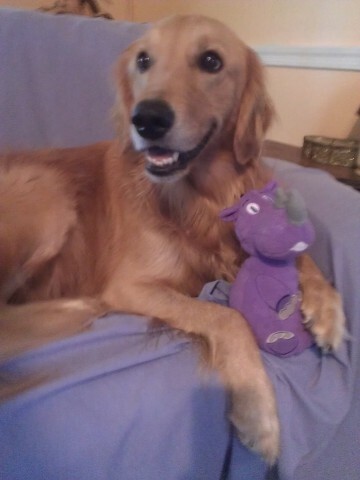 As I’ve mentioned before, Jessie is an absolute crocodile-jawed beast when it comes to playtime, so investing in high-end toys that have staying power is absolutely worth the extra investment. Naturally, she took to the sturdy Tuff Enuff Rhino Wobble like a panda to bamboo. She had a blast “mouthing” the rounded end of the Wobble like she does to her security blankets and she was more than excited to show off her new toy to the entire family. Jessie is just too photogenic, isn't she? All in all, Tuff Enuff’s Wobbles are as rugged as they are cute and I would recommend them for dogs that like to play rough, but like to take their favorite toys to bed for a snuggle afterwards. Endangered species taste the BEST! Thanks, Tuff Enuff!